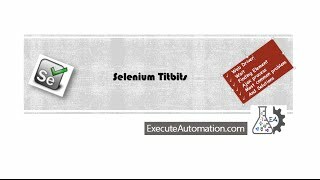 In Selenium Titbits video series one can learn Selenium tips and tricks starting from most basic to advanced tricks. These titbits sometimes comes very handy while you are starting to look for some interview questions or may be something which act as a handy little trick while doing regular selenium code. In this video we will discuss on checking Control exist using Selenium, this will be very helpful while checking the control existence even in wait statement.